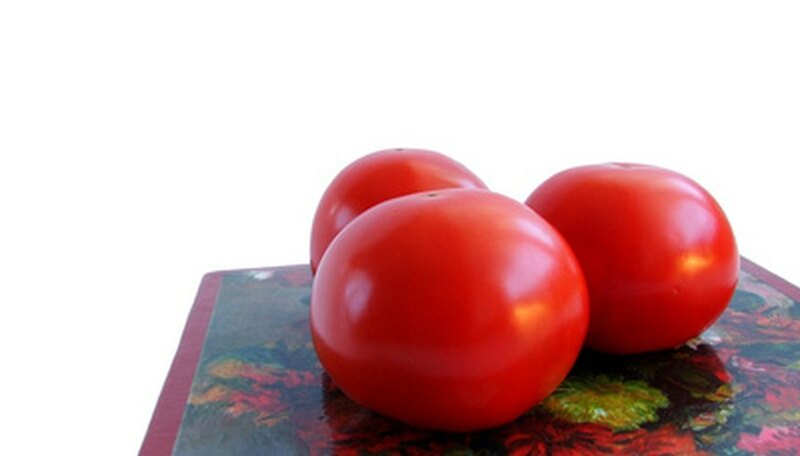 An heirloom, or open-pollinated, tomato is a tomato grown from seed passed down through the years from one grower to another in order to preserve a certain feature. For example, most heirloom tomatoes are considered better-tasting than many other varieties. However, heirloom tomatoes are not bred for the same disease or pest resistance as modern hybrid tomato plants. There are several different types of heirloom tomatoes with each type having some unique characteristics. Determinate tomato plants have a shorter time to maturity than other types of tomato plants. The tomatoes on the plants usually ripen within a narrow window of about 45 days or less. Determinate tomatoes are not usually staked, as many grow into a bush form with shorter spaces between the leaves. They can be grown easily in smaller gardens or in containers because they take up little room. Determinate tomatoes are often grown in areas where the cooler spring season, which is best for growing tomatoes, is short. Some varieties of types of determinate heirloom tomatoes are: Marglobe, Meford, Starfire and Salsa. The type of tomato known as an indeterminate heirloom tomato plant grows into a large plant commonly known as a vine. These vine type heirloom tomatoes produce the largest fruit, but have the longest time to maturity. Many varieties have large leaves and are referred to as potato-leaf varieties. Indeterminate tomatoes need to be staked to prevent the fruit from touching the ground, where it can easily rot. They grow best in larger gardens where they are given plenty of room. Indeterminate tomato varieties struggle in parts of the country that experience intense heat during the middle part of the summer. Some varieties of indeterminate heirloom varieties are: Brandywine, Cherokee Purple, Mortgage Lifter and Black Krim. Cherry or small-fruited heirloom tomatoes are usually indeterminate, although a few varieties, such as Green Grape, a green cherry variety, are determinate. Cherry heirloom tomatoes are grown in the same conditions as regular tomato plants. They are suitable for growing in warmer climates because they continue to produce in hot weather. Cherry tomatoes that are indeterminate grow best if the plants are staked or supported with a trellis. Some examples of cherry heirloom tomato varieties are: Yellow Pear, Red Fig and Black Cherry.